The students here at the CIA had a great change from the norm for their Friday afternoon camp activity. An American from off campus came to teach skateboarding. 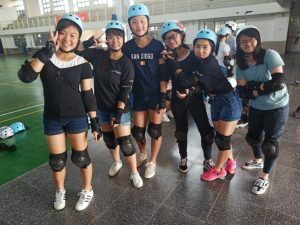 Our students were kitted out with helmets, knee and elbow pads, and were provided standard skateboards. Then came the fun! For many of the students, this was the first time they had ever tried it. As in everything, some students took to this activity with alacrity, and others were a little less confident. What was great to see was that those who had a little experience helped their classmates to balance on the board. This was an example of a great team-building, collaborative exercise in which everyone helped everyone else. It was a bit like the “fall back into my arms” exercise: trust your friend to catch you. In this case, it was to trust your classmate to help you balance on the board and then trust yourself. The American instructor and his colleague were very encouraging and the entire activity was conducted in English. These kinds of activities really create a lasting bond among our students and that’s what we at CIA are trying to foster. Yes, academic excellence is a priority, but nurturing life skills and teamwork are also high on our list as educators. We want the students here to feel that they are in a community. Events like the one we had last week really do add to a positive student culture both in and out of the classroom.